Below you will find instructions on how to submit curriculum updates through DocuSign. If you need additional technical assistance please contact Tyler Bick at tbick2@sscc.edu or 800.628.7722 x2776. With any Curriculum related questions please contact Angie Moots at amoots@sscc.edu or 800.628.7722 x2520. Please Note: Prior to submitting your DocuSign Action SHeet & Textbook Change form, you should have all of your supporting documentation e.g. syllabi, program outlines, agreements, etc. finalized ahead of time. You will email these documents to Angie Moots once the DocuSign form has been submitted. The link to SSCC's Curriculum Action Sheet and Textbook Change Form is located on the Curriculum SharePoint Site. 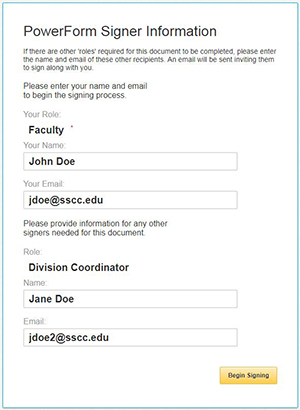 This can be accessed by navigating to Faculty & Staff > SharePoint Sites > Curriculum > DocuSign Action Sheet & Textbook Change. After 120 minutes of inactivity your session will time out. If this timeframe is exceeded you will lose what you have entered and have to restart the process. You will NOT be able to fill out certain "child" sections before filling out the "parent" section e.g. "A. Change an existing course" and "adopted text (refer to section G)" must both be checked off before you can make changes to section "G. Textbook Change." When requesting changes to existing or new courses, programs, transfer agreements, or textbook changes you will also be required to email those document to Angie Moots at amoots@sscc.edu. After you have submitted the DocuSign Action Sheet & Textbook Change form you will need to email Angie Moots, at amoots@sscc.edu, all updated syllabi, program outlines, and transfer agreements. The Textbook Change Form is now combined with the Curriculum Action Sheet. This means from the link in the Curriculum SharePoint Site you will be able to make regular action sheet updates and textbook changes. Note: You will NOT be able to fill out certain "child" sections before filling out the "parent" section e.g. "A. Change an existing course" and "adopted text (refer to section G)" must both be checked off before you can make changes to section "G. Textbook Change." Begin filling out the form. Make sure to fill in section "A. Change an existing course" by selecting the check box next to section "A". Then, under the "Check all items changed" select the check box next to "Adopted Text (refer to section G)". Once Adopted Text is checked, section "G" will become fillable. Check the box next to section "G", and begin filling in your textbook information. The DocuSign Action Sheet & Textbook Change Form was set up to improve the accuracy of these documents. 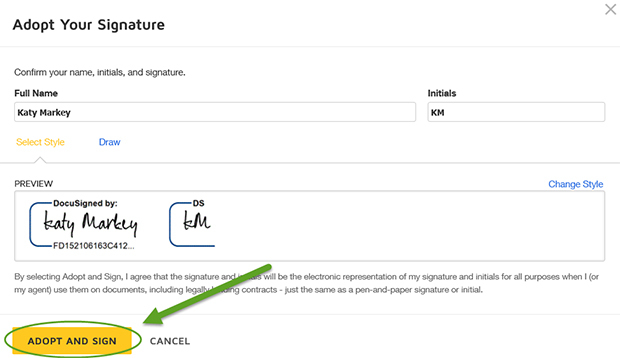 This means that if any information is left off the form then DocuSign will not allow you to submit. Before selecting 'Finish' ensure that all fields are filled out correctly. There will be no change as to how you submit your syllabi, program outlines, or transfer agreements to the Faculty Associate, Angie Moots. The only change is to the form that communicates the changes to other Faculty & Staff. After you have submitted the DocuSign Action Sheet & Textbook Change form you will need to email Angie Moots, at amoots@sscc.edu, all updated syllabi, program outlines, and transfer agreements.